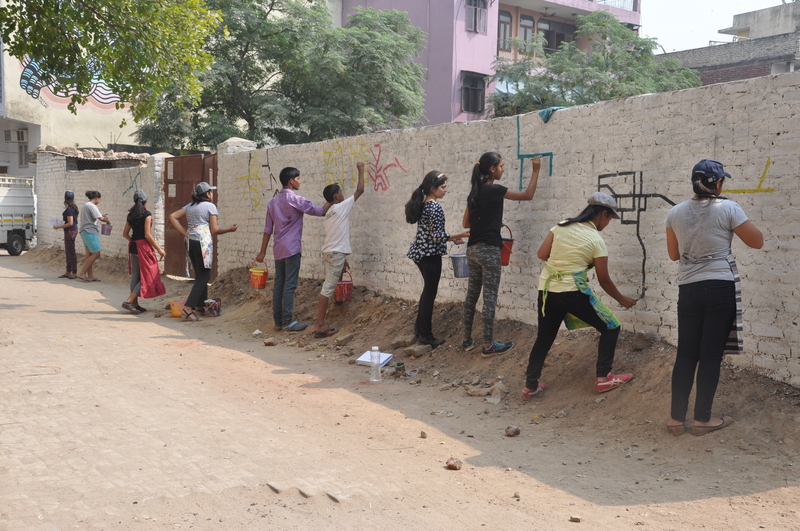 In an artistically-charged endeavour, the October session with artist Ruchin Soni saw students step into the domain of the public to try their hand at street art. 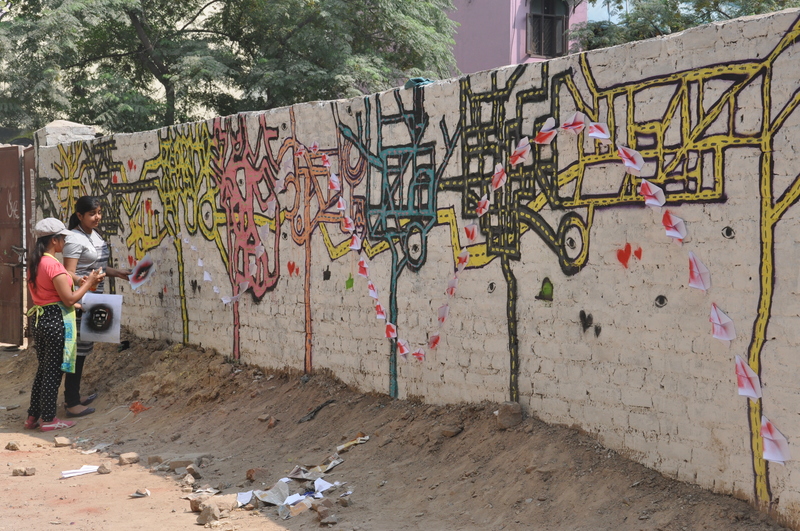 Toying with the idea of throwing open a world of possibilities on a wall which posed as their new-found canvas, our mural artist pinned his philosophy in the nascent minds of the students. 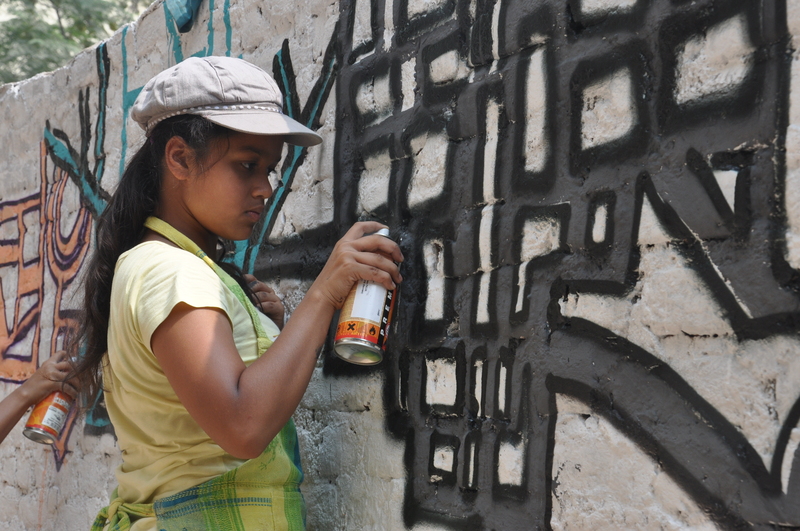 Using the discourse of street art as a means of creating a vibrant modern culture in the times with the students, the intent of the workshop was to make inroads into the public space. The element of accessibility and the bent of free expression provided the students with an equal, spirited and sensitive atmosphere to ‘access’ art. Deeply immersed in the strand of mural art himself, artist Ruchin Soni employed the trope of personalized imagery as part of the initiation. The process of invoking the form and content for their ‘canvas’ saw the artist and the students jostling with the relevant euphemism for the space of the wall. The element of ‘anonymity’ which is a dominant underpinning of the artist’s own body of work and expression found its way with students taking a rudimentary shot at mapping out their personal space on the chosen wall. Experimenting with material and medium to speak an assorted language employed in the exhibit of street art, the students under the mentorship of the artist took to origami. The dynamics behind the process of crafting using origami gave their wall a multifarious dimension. The rendition that wall wore and the transformation that the dilapidated brick wall underwent in the course of four days brought wonderment to all and sundry including the curious onlookers present in the urban village. The bare wall eventually donned the garb of a wall that speaks!